After attending culinary school in Brittany, Greg Marchand worked in London with David Nicholls at the Mandarin Oriental before being transferred to the location in Hong Kong to work at Jean-Georges Vongerichten’s Vong. He returned to London, then moved on to a restaurant in Andalusia, then another, and eventually returned to London where he become head chef at Jamie Oliver’s Fifteen. From there, he was off to New York where he worked at Gramercy Tavern with Michael Anthony. All of this led up to returning to France and creating his own “place that was the sum of all (his) best experiences.” That place is Frenchie on the rue du Nil in Paris. I seem to keep hearing great things about this chef and this bistro, and I couldn’t wait to read the new English version of his book. The book is Frenchie: New Bistro Cooking , and I received a review copy. The dishes are seasonal and made special with added touches. The Wild Garlic Broth with Fresh Crabmeat is a soup garnished with sourdough croutons, olives, thinly sliced spring onions, herbs, and lemon. For the Watermelon, Ricotta Salata, Mint, and Pine Nut Salad, in the restaurant, the watermelon is compressed sous vide to make the texture more dense resulting in a deeper shade of red. Of course, at home, fresh, cubed watermelon can be used instead. I want to attempt the Brined Chicken with Roasted Zucchini and Tapenade and the Fresh Tagliatelle with Chanterelles and Lemon Zest. But while our local strawberries are in season, I had to try the Bittersweet Chocolate and Strawberry Tart first. The other day, Kurt asked me if we’ve been eating a lot of strawberries lately. I might have gone a little crazy with how many I’ve brought home in a few short weeks, but I can’t get enough of them when they’re in season. In the book, fraises des bois are suggested for the berries, but sadly, they don’t grow here so far as I know. Our local strawberries are smaller than the grocery store variety, and far more flavorful. I brought home the smallest, reddest, local strawberries I could find. Making the tarts requires a few separate steps which can be spaced out as needed. First, the pastry dough was made with all-purpose flour, cake flour, and almond flour whisked with confectioners’ sugar and some salt. Cold butter was worked into the dough by hand, and then an egg was stirred in before the dough was flattened, wrapped, and chilled for a couple of hours. The dough was then rolled out and gently pressed into a tart pan, and it was chilled in the pan while the oven pre-heated. The tart shell was blind baked with pie weights in parchment, then with the pie weights and parchment removed, and last with a brushing of egg wash. As the tart shell cooled, the filling was made with warmed cream, milk, and sugar that was poured over dark chocolate pieces. The mixture was whisked until smooth and cooled, and an egg was added and mixed into the chocolate. The filling was poured into the tart shell, and the tart baked again until just set. Once at room temperature, the tart was topped with strawberries, a drizzle of olive oil, and a sprinkling of fleur de sel. This was a dreamy chocolate-covered strawberry in the form of a tart. The creamy, dark, bittersweet chocolate filling with the sweet crunchy crust and juicy, berries was a perfect combination. The olive oil and salt nicely pointed up all the flavors. The only caveat with this tart is that it’s best on the day it’s made. The filling is best at room temperature, and if left to sit too long, the strawberries would begin to give up their juices. If you need to store it overnight, you could try refrigerating the chocolate tart with no toppings. Then, bring it to room temperature, and add the strawberries, olive oil, and salt to each piece before serving. It does make for a delicious way to celebrate strawberry season, and I can’t wait to celebrate with more things from the book. Excerpted with publisher's permission from Frenchie: New Bistro Cooking by Greg Marchand (Artisan Books). Copyright © 2014. Photographs by Djamel Dine Zitout. Wild strawberries, fraises des bois, are a rare delicacy that form a magical alliance with the intensity of bittersweet chocolate. If you cannot find them, choose the smallest, most fragrant strawberries at your farmers’ market. Cut the butter into small pieces. Whisk the flours, almond flour, sugar, and salt together in a medium bowl. With your fingertips, work in the butter until the texture is sandy. Quickly beat the egg with a fork in a small bowl, then add to the butter mixture and mix with your hands until the dough just comes together. Flatten the dough into a disk, wrap in plastic wrap, and chill for 2 hours. Put the dough on a large sheet of plastic wrap or wax paper, cover it with another sheet, and roll it into a 12-inch circle. Lift off the top sheet of plastic wrap and carefully invert the dough into the tart pan. Lift off the second sheet and gently press the dough into the bottom and up the sides of the pan, then cut off the excess by running the rolling pin over the edge. (The dough is fragile, but any tears can be patched easily.) Chill for 30 minutes to 1 hour. Preheat the oven to 325°F. Cut out a parchment paper circle (see the photos on page 74) and line the tart shell with the parchment. Fill with dried beans or pie weights and bake for 20 minutes. Remove the beans and paper and bake for 5 more minutes. Brush the tart shell all over with the egg wash. Bake for 5 to 7 minutes longer, until golden brown. Let cool to room temperature. Reduce the oven temperature to 300°F. Finely chop the chocolate and put it in a bowl. Combine the cream, milk, and sugar in a medium saucepan and bring to a boil, stirring to dissolve the sugar. Pour the boiling liquid over the chopped chocolate and let stand for 30 seconds, then mix with a rubber spatula until the mixture is smooth. Let cool to lukewarm, then mix in the egg. Pour the filling into the baked tart shell and bake for 25 to 30 minutes. The tart is done when the filling is just set. If you shake the pan gently, the chocolate mass should move in one block. Let the tart cool to room temperature on a rack. Do not put it in the refrigerator! This tart should be served at room temperature on the day it is made. 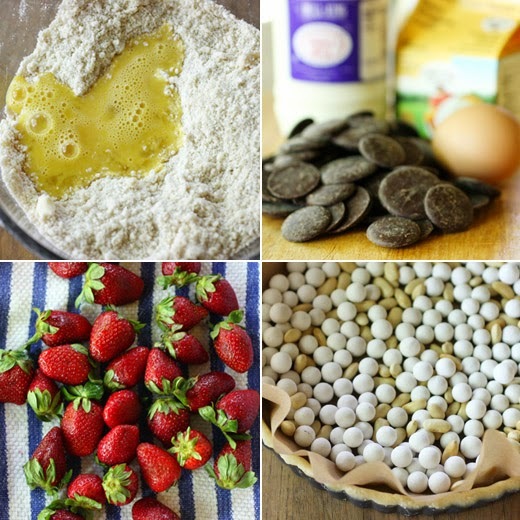 Unmold the tart. 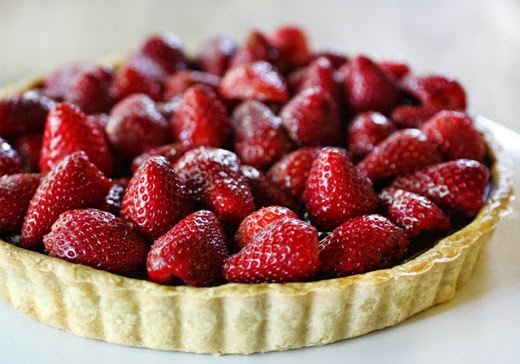 Arrange the strawberries on top of the tart (if using bigger strawberries, cut them into halves or quarters). Sprinkle with fleur de sel and add a dash of olive oil. A pretty and luscious tart. Although I don't like to combine fruits with chocolate, I'm sure I'd enjoy this wonderful pastry. This looks scrumptious, Lisa. I love the combo of chocolate and seasonal berries! every time I get fresh strawberries or raspberries I always promise myself I will make a tart with them, but it never happens as I eat them all the next day! I am obsessed. I eat a lot of berries a day. Lisa, this tart is gorgeous. Dreamy is right! This is one amazing tart!!! What a stellar tart! Our strawberry harvest is just beginning and this lush dessert would be a splendid way to welcome the season! I sometimes (by which I mean rarely!) see wild strawberries at farmer's markets. I should get out in the countryside and find a source! Lovely recipe-- so nice. Sounds like a terrific book, too. Thanks. What a lovely tart! And the cookbook sounds awesome. Would love to visit Marchand's Frenchie. Put it on my Paris list. I love this Lisa and look beautiful tart.I love the strawberries in it! 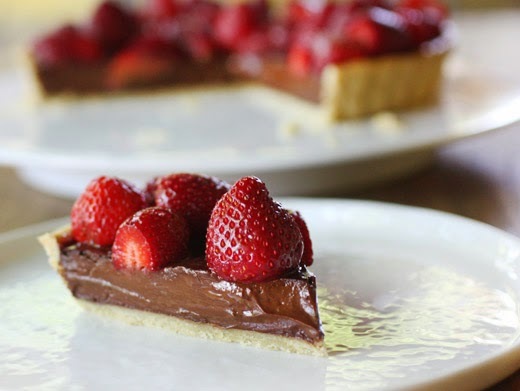 What a beautiful tart Lisa...I can only imagining a nice forkful of this pie...flaky crust, creamy chocolate and fresh strawberry...awesome! Damn, fingger licking good bitter sweet tart!!! Such a gorgeous tart!! The sprinkling of fleur de sel sounds divine. this tart looks delicious ! Oh wow, this tart looks gorgeous! Chocolate and strawberry is the best combination!